In 1930 a small wooden boat set sail for unknown adventures. This might not in itself be remarkable; however, this was a journey that was eventually to lead from Kiel in Germany to Bruny Island, Tasmania. The boat was called Te Rapunga, a 32ft double ended ketch and on her initial voyage she had a crew of four; with Captain George Dibbern, 1st mate Gunter Schramm, Albrecht von Fritsch and his sister Dorothée von Fritsch as crew. Leaving behind a wife and three children, the ensuing journey was both a spiritual and worldly discovery of time and place for George. Variously called a vagabond, free thinker, sailor-philosopher and adventurer; George described himself as a “citizen of the world and a friend of all peoples.” A description that has been borne out by the life he led and the connections and support he received around the world during his voyages. After renouncing his German citizenship, he created his own passport and flew a flag of his own creation. Without an engine or communication devices George sailed the internet of the ancient world, utilising established sea routes, creating friendships and sharing discoveries and philosophies. Between 1930 and 1934 Te Rapunga travelled through the Mediterranean, crossed the Atlantic, sailed the Panama Canal and on to San Francisco, Honolulu, Samoa, eventually landing in Auckland, New Zealand. 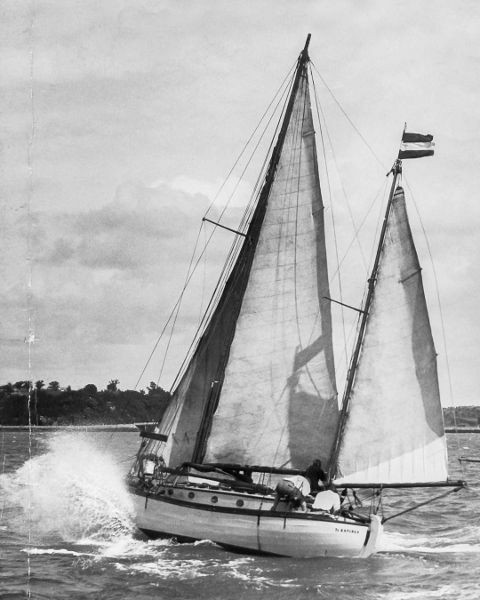 While it is fair to say that his association with Tasmania really began in 1934, when Te Rapunga was invited to compete in the second Trans-Tasman Yacht race from Auckland to Melbourne, George in fact had travelled through Tasmania in 1910. The race took 19 days, the boat sprang a leak early on in some “boisterous” weather and had to be repaired delaying them 44 hours. Continuing, Te Rapunga went on to take line honours from the only other competitor in the race, Johnny Wray with Ngataki. The two boats were again invited to take part in a race from Melbourne to Hobart in connection with the Royal Hobart Regatta. George and his crew again proved to be the better boat and arrived in Hobart on 29 Jan 1935. 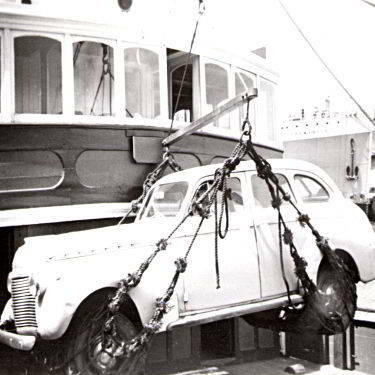 The boat was berthed at Princes Pier and proved to be a great draw card for the people of Hobart. After a month of being fêted by the people of Hobart, giving talks at schools, clubs, in the jail and on the radio, Captain Dibbern was given a civic farewell at the Hobart Town Hall. The Lord Mayor spoke of the pleasure which Captain Dibbern had given to his many friends since his arrival in Hobart a month ago and wished him God speed. Later, George was to write that as they sailed slowly down the Derwent nodding and waving to those who had made them so welcome, “the wish grows strong in me to return one day and sail up the Derwent, once more to come from far away like a deep-sea ship to Hobart.” The crew were to spend a few days exploring the D’Entrecasteaux Channel before heading off once more across the Tasman Sea. But it was here as Tasmania receded into the distance, “In the hours of the night at the tiller, alone with the wind and the stars” that George’s future direction was mapped out. “- I see my road, my aim, my task…it is to be a bridge of good will. …a bridge is impartial, is neutral. And so, I too must be neutral; if I am honest in my desire to be a bridge between nations I must sever all national ties, I must fly no national flag, and serve, instead of one country, all countries. George continued to sail the Pacific, Hawaii and Canada, it was during his Pacific wanderings that George wrote & published his book Quest, the book ultimately came to the attention of the author Henry Miller. Miller who considered George to be a like minded soul, began a correspondence that was to continue for many years and included personal intervention in the welfare of George's family back in Germany, after the war had ended. This relationship also brought George's philosophy and ideals into a literary circle that included the likes of Anaïs Nin and Lawrence Durrell. Returning once again to New Zealand in 1941, George was interned for a second time on Some’s Island as an enemy alien. After the war, George once again took to the seas finally returning to Tasmania 15 years after his last visit. It was a surprise lottery win that cemented his connection to Bruny Island, in 1950 he purchased Woody (Satellite) Island and later Partridge Island. Both these islands are situated off the coast of South Bruny. George, Eileen and their young daughter continued to live on and farm Satellite Island for the next three years. Since George’s death, the baton of trusteeship has passed a number of times. It has been a long and at times challenging course. Bruny Island Coastal Retreats and Nature Pact together with the help of some fellow sailing enthusiasts have seized the baton for the next leg. Our goal is to realise Erika Grundmann’s “nostalgic vision” - to fully restore and return Te Rapunga to the Sea - her rightful home. Erika has kept the story afloat by writing in enthralling detail the biography of George Dibbern in her book, Dark Sun: Te Rapunga and the Quest of George Dibbern. This book, together with George’s own book, Quest, inspired us to go out and find this remarkable boat. A small 32-foot ketch that travelled vast distances without motor or communications, from Germany to New Zealand onto Bruny Island and beyond, placing George at the mercy of strangers and the vicissitudes of the ocean - the world’s ultimate medium of connection. Nothing better immerses in and harmonises with the forces of nature than a wooden sailing boat. We felt that this little “bathtub” of a boat, the vessel of George’s spiritual quest, deserves a better fate than to languish in a suburban front yard in Auckland. So, we have taken up the challenge to refloat Te Rapunga, bringing it back to Tasmania, where the art of wooden boatbuilding, itself at risk of disappearing, still burns brightly. This project is a joint celebration of both the boat’s restoration and the craft that makes her salvation possible. In a world of growing political polarisation and discord, we also felt that George’s message of global citizenship and his life’s purpose to be a bridge of goodwill, to be of particular pertinence and could do with some amplification. The sea epitomises island life, wooden boats and the tradition of exploration. Seafaring vessels have always been crucial to Bruny Island, connecting it, at times in surprising ways, to a world otherwise so isolated from it. We are fascinated by the hidden histories and local stories that form part of our cultural landscape, especially those that interact harmoniously with the natural environment. In the vein of the early explorers, naturalists and expeditioners, we are setting sail in our little bath tub of a boat on a voyage of discovery, not knowing where the journey will take us or what we will learn. We invite you to join us in our foray to delve deeper into the ever-increasing web of connections and associations, to appreciate the poetry of nature, and to use history to give place and landscape a connectedness, in a new and exciting way. Students and teachers from International Grammar School Sydney stayed Bruny Island Lodge for an art camp. Using inspiration from the natural surroundings, they worked together to create works of art.